Kate's discussion of the Elliots' spendthrift ways in Persuasion reminds me of Sir Walter's diametrical opposite (geographically and economically). Abacus and Sword (which unfortunately doesn't seem to be available with subtitles) is a biopic about a Kaga province government accountant (Naoyuki Inoyama, played by Masato Sakai) in the mid-19th century. Upon becoming the head of the household and taking over the family's finances, Naoyuki discovers that for decades his parents have been spending far beyond their means and institutes a strict austerity program. Their neighbors got themselves into a similar fix and ended up having to abandon their estate and move into the tenements. With this harsh reality as a backdrop, Naoyuki convinces his family to retrench with a vengeance. They sell off every luxury, kimonos and books, and even adopt a sparse diet. Naoyuki negotiates a no-interest loan with the lenders to cover the rest, pointing out that they'll be left worse off if he declares bankruptcy. In one of the most endearing scenes (it's in the trailer), samurai families were expected to serve expensive fried snapper at the eldest son's coming-of-age ceremony. But they display pictures of the fish instead. Not only Japan and the United States, but pretty much the entire planet could use more public servants as good at pinching pennies as Naoyuki Inoyama. The vanguard company of 150 Mormon pioneers covered approximately 1000 miles in four months. The wagon train consisted of 73 wagons, one cannon, 93 horses, 52 mules, 66 oxen, 19 cows, 17 dogs and a number of chickens. It carried enough supplies to fully provision the group for one year once it got to Utah. The Shouzan covers a shorter distance (one way), but there are fewer foraging opportunities (though kijuu will eat dead youma). Shitsu Kiwa has a big wagon and is unaware of how experienced travelers eat (covered in chapter 24). As a result, his group alone would require a considerable amount of livestock. To paraphrase Napoleon, "The Shouzan marches on its stomach." Today through Sunday, the Kindle edition of Angel Falling Softly is free at Amazon . Serpent of Time is free at Smashwords, Nook, and iTunes. Now sporting a new and improved cover! It's available in print at Amazon and from all the major ebook retailers. A rike (里家) is a foster home for orphans and the aged. In A Thousand Leagues of Wind, Youko goes undercover at a rike to further her education. Shoukei ends up at a rike after her family is killed in a coup, and nearly gets killed herself when the people there find out who she is. Robert X. Cringely is posting online his excellent history of the personal computer: Accidental Empires, later made into the equally good PBS documentary, Triumph of the Nerds (Netflix has it). It's 20 years old, but remains a definitive account of the early years of the digital revolution. Some people wax nostagic about high school or college (I don't understand those people) or classic sports contests from their youths. Well, I do remember when Danny Ainge got BYU into the Elite Eight with that fantastic last-minute drive to the basket, only because I was a BYU student at the time. But the world of the PC back during the 1980s? That's where the real action was. Reading about those old battles—the great 8088/8086–80286–80386 transition—I find myself harboring feelings of actual nostalgia, the way I suppose gearheads do reminiscing about cars that had carburetors. The first personal computer I used was my brother's Apple IIe. (I actually wrote the first chapter of Tokyo South on an Apple II Pascal editor in the BYU computer lab.) He learned Assembly programming. I learned the miracle of word processing. There was no going back to typewriters after that. When I was in grad school, a roommate had one of those early PC clones Cringely talks about, a Corona luggable. Corona got sued by IBM for infringing on its BIOS copyright. Compaq and Phoenix changed the whole equation by reverse-engineering the BIOS. Ah, that was when the BIOS chip was a super big deal. Phoenix Technologies still makes BIOS chips, but like the rest of the PC component business, they're a dime-a-dozen commodity that nobody cares about but the nerds. This was an era when a computer magazine could last you a whole transcontinental plane trip. They were the size of telephone books and crammed with ads. Rock 'n Roll capitalism at its best, technological competition supercharging technological evolution faster than anybody could predict. Hey, a parallel port and a serial port on the same 8-bit ISA card! And EGA! 640 × 350 pixels! No, VGA! Wow, 640 x 480 pixels! That blew everybody's mind. Thanks to a swarm of aftermarket suppliers, the individual user could—was expected to—trick out a plain vanilla PC to an amazing degree. Now a generic PC comes with 4 GB of RAM and a half-dozen USB ports out of the box (no serial or parallel ports) and VGA is lame on cell phone displays. We've come so far that these electronic miracles have become ho-hum. But we shouldn't forget the great debt of gratitude we owe IBM and Microsoft. I speak from personal experience. 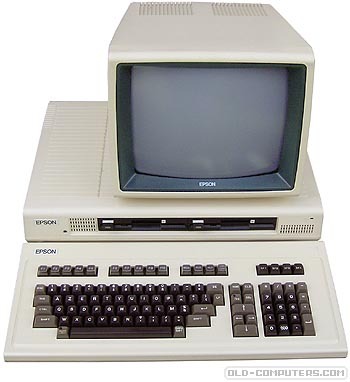 My first PC was a Kaypro and my dad's was an Epson, both CP/M machines. The Epson QX-10 was faster than the IBM PC, came with a whopping 256K RAM, and had a beautiful monochrome EGA+ display. But it was a proprietary Dodo bird. At the end of its technological life, its software and hardware died with it. And Apple at the time—quite forgotten today—was imploding. Steve Jobs nearly destroyed the company the first time around before saving it after his 40 metaphorical days (10 years) in the desert. Entirely by accident, Cringely archly observes, IBM and Microsoft created the universal PC hardware standard. IBM later tried to go its own way with MicroChannel and OS/2, but failed its way back to PCI and Windows before throwing in the towel (and creating one of China's best companies, Lenovo). Even Steve Jobs eventually climbed on board the Intel/PCI bandwagon, which is why you can dual-boot Windows on a Mac. And Linux wouldn't exist without those mass-produced beige boxes. All thanks to a clueless IBM desperately battling fundamental market forces. And then losing even as it won. Which perfectly describes the very annoying proliferation of USB cable connectors. 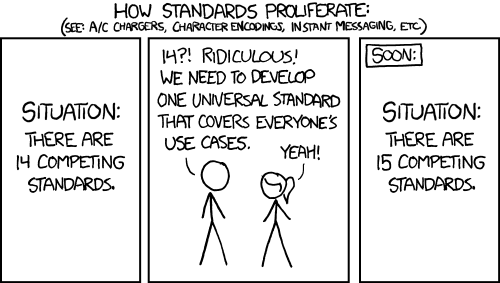 Hey, somebody needs to create a standard. 天帝　[てんてい]　Tentei, the "Lord God Creator," which, I confess, are the first three words in the definition returned by WWWJDIC. I thought they looked good strung together. "It's not personal. It's business." Not a literal translation, but close enough that I couldn't resist. Accommodating the surge in missionaries occasioned by the lowering of the age requirement, 18 for men (from 19) and 19 for women (from 21), the Mormon church has added 58 missions (mostly by dividing existing ones), bringing the total slate to 405. Hearing that news, a light went on in my head. No--it couldn't be--but it did make sense--so with baited breath I checked the list. 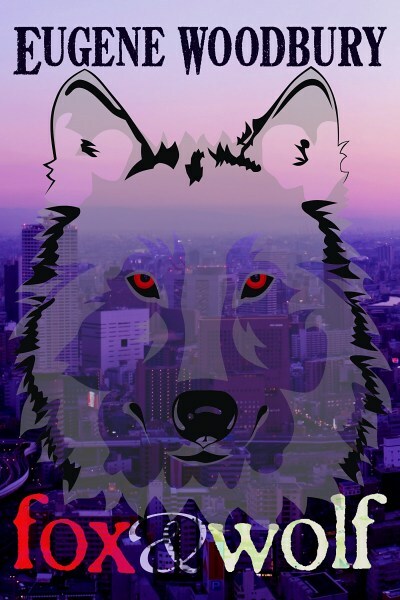 And wouldn't you know it: Tokyo South is back! Tokyo South was born in 1978, a few months before I arrived in Japan. After a three-decade long roller-coaster ride, it was shuttered in 2007, merged with Tokyo North to create the original entity from which it had sprung. And now it stalks the earth once again. Tokyo South is the zombie mission. It won't stay dead! But while the new rules (especially for women) should push up long-term missionary numbers, I have to wonder if these levels can be sustained once the current surge washes through the system. Back in the day, missionary service was considered a Mormon male rite of passage, like the military draft once was. And then, as I observe in the introduction to Tokyo South, the church shifted to "the few, the proud" mode (and the fewer women the better). Now it's apparently gone back to casting a wide net. Well, if big numbers are the goal, the only question is how low the common denominator can go. As Tokyo South shows: pretty dang low. And yet, I've since concluded, this isn't necessarily a bad thing. From a purely practical standpoint, the mission should not have become the venue of choice for Personal Growth and Rehabilitation. But we are an imperfect species, and if not now, when? More importantly, the church remains in short supply of what universal conscription supplies the nation in times of crisis (an organized religion, by definition, being constantly in a time of crisis): a common cause and experience that reaches simultaneously across generations. Still, for every "spring forward," there's a "fall back." Call it the "Daylight Saving Time effect." I won't be surprised if Tokyo South goes back on the chopping block in a few years. That it was axed in the first place shows how tenuous the church's hold is in Japan.